Metro Detroit commuters practically need two hands to count the number of billboards they see on their way into work featuring Bernstein family patriarch Sam and his three children, Mark, Richard and Beth. The dream of every parent is to live in the shadow of their children, and Im living in the shadow of my kids, Sam Bernstein says of his progeny, all of whom are continuing the history of their lawyer-filled family. Sams father, Mandell, and his three brothers were attorneys. So was Sams mother-in-law, Estelle Koblin Nelson, one of Michigans first female lawyers who, Mark points out, passed the bar when Sandra Day OConnor was 3. Maybe its genetic, or maybe theres something in the water of the childhood homes of local lawyers who have gone into practice with their mothers, fathers, sisters and brothers. But surely all relationships between members of local legal families arent always as sunny as those of the Bernsteins. After all, families are one of humanitys greatest blessings and damnedest curses. Each one of us in my family has unique strengths, and it makes practicing as a family easier in that regard, says Mark Bernstein, Sams eldest son, of the divide-and-conquer mentality that makes the Bernstein and other family firms run so smoothly. Such a strategy ensures that the siblings get a chance to be independent practice managers while still relying on one another to ensure the entire firms success. Its a path followed at the Findling Law Firm in Royal Oak. When our office was created, we felt it best that we each defined a particular area on which we would manage the practice group, says Darren Findling, the youngest brother of fellow attorneys David and Daniel, all of whom practice alongside father Fred at the firm in Oakland County. And it allowed us to grow the area without stepping on or competing with anybody else in the family. 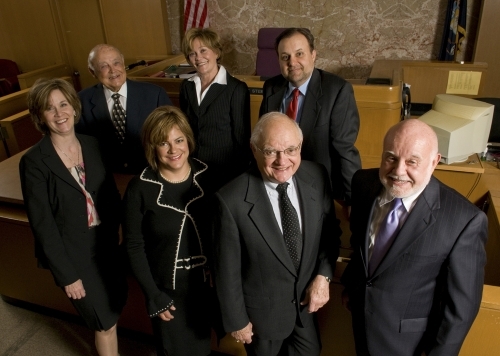 The dividing line is particularly sharp at Femminineo Attorneys in Mount Clemens. Practicing with your family is such a love/hate relationship, says attorney David Femminineo. He and older brother Jacob Jr. embrace an extreme division in their shared law practice. We do not, under any circumstances, handle each others cases, David says. The Femminineo brothers are the yin and yang of legal siblings, differing on everything from the types of cases they take and how they handle them (Davids strictly personal injury, single-handedly juggling 200 open cases; Jakes the first to say he hired another attorney to get out of his 150 pending divorces) to their after-hours schedules (David heads home to his family; Jake, who prefers travel to children, makes the rounds schmoozing county political figures as a Macomb Charter Commissioner and past president of the Macomb County Bar) to the liquor they drink (David beer, Jake scotch). Were an absolute set of opposites that work in incredible harmony, David says. The brothers guess that if their father, Jacob Sr., who died of a heart attack 13 years ago, were practicing with them at their Main Street firm, he would fall directly between his sons extremes. You can count on it, David finishes, Take it to the bank. Macomb County Circuit Judge David Viviano, who grew up with David Femminineo and now partners with him on the golf course, explains that the closeness of the Macomb County legal community heavily influenced him, his older sister Kathy and younger brother Joe into following their father, Macomb Circuit Judge Tony Viviano, into the law. Just being around it, and not just him, but a lot of our friends parents, David begins. One of his best friends is David Femminineo, his father chimes in. See what we have to deal with? David says, turning to his father, and asking, Can I just answer it for myself? Being around lawyers at social functions, he finishes. Joe enters the conversation with, That said, theres no question that its a testament to my dad that three of the seven children became lawyers. I think its directly attributable to him and how much we admire him and respect him. Thats a big reason why we do what we do. Wouldnt have been too hard for you to choke that out of your mouth, Joe fires at David. What, are you running PR for Dad? comes his brothers reply. Members of several of the local legal broods point to watching their parents and relatives practice law as the reason why they followed in the family footsteps. Mark Bernstein recalls going to take measurements at accident scenes with Sam, a practice hes continued with his own 5-year-old son. Daniel Findling read witnessdepositions on the stand in federal court at 16. There really was never a question, Mark Bernstein says of why he, Ricky and Bethie joined the bar alongside their father. There was a sense of obligation, a sense of respect and that really motivated all three of us. For Steven, Michael, and Jacalen Garris of Ann Arbors Garris, Garris, Garris & Garris (the fourth, or perhaps first, is for their late father Jack, who passed away in 2005 at age 85) the career path laid out by their father was youre going to college, youre going to law school, youre going to work with me, Steve says. I wanted to take a break between college and law school and work at a ski resort or something, and my parents said, You can do that after youre done, says Jackie, the youngest, deadpanning, Right. You all wanted to be ski bums if I wouldve let you, says their mother Helen, who at 83 still does the firms taxes and helps take care of the books. I get mad at them because Im the little sister, Im the only girl, and sometimes they tease me, Jackie continues. I have to follow them around to talk to them sometimes. Its not much different here than on the outside. Harper Woods appellate attorney Mike Szymanski, the second of longtime Wayne County Probate Judge Frank Szymanskis seven children, earned a reputation on the playground as someone who could help iron out disputes. The four eldest Szymanski boys are now all attorneys: Patrick is a top labor lawyer in Washington, D.C., while Frank and David are both judges in Wayne County, David in probate court and Frank across town at the juvenile courts Lincoln Hall of Justice. Sitting around a Northville conference table with the Stempiensbrothers Ron, Marvin and Greg; Marvins daughter, Lisa; Gregs son, Eric; and Laura Bertus, sister of Gregs wife, Wayne County Circuit Judge Jeanne Stempienis like being a guest at Thanksgiving dinner, offering a peek into how their familial relationships factor into their professional lives. November 2007 was the last time the whole family gathered for a holiday meal, where the main issue was the contents of the turkey dressing, cracks octogenarian Ron, still practicing in Trenton. Its rare for a minute or two to pass without a similar quip from someone at the table, inspiring a chorus of deep, throaty cackles. The distance that developed between the three Stempien brothers as they finished law school and started families kept them from forming one consolidated law firm, but they continue to influence each others careers around Metro Detroit. It may not be the super Stempien firm, but weve all worked for one another at one point in time in one capacity or another, Bertus says. Greg served as older brother Marvs law clerk while attending Detroit College of Law and Lisa, Eric, and Rons son, Tim, all spent time clerking in Marvins Wayne County Circuit courtroom. Over the years, a total of 16 members of the Stempien clan have worked in the law in some capacity. For me, one of the really nice things is Ive got all these different people I can call to get unvarnished legal advice from, Eric says of the benefits of practicing together. And with other lawyers, you just never know what youre getting from a lawyer. I can call my Uncle Marvin or my Uncle Ron or I can walk over to my dads office or I can call anybody and say, Hey, have you faced this problem before? And people whove practiced for fifty some years now generally have probably faced that same problem that Im dealing with. Despite their different practices, the Findling family embraces a similar team approach when tackling legal issues. Theres a lot of capital thats inherent in working with your family, Darren says. There are never issues of trust. We know that our family will be looking out for each other without having to look over our shoulder. Its a sentiment echoed by brother Daniel. If theres inherent trust, it works ultimately, Daniel says. If theres not, its not gonna work. Once you get through all the sibling stuff and the fighting, it you trust the people and respect the people that you work with in your family, its gonna work even if you disagree. And sometimes we vehemently disagree, but we still trust each other. Its also sometimes nice just to have some company. If youre all by yourself as an attorney, it becomes very difficult, says Tony Viviano, who spent many years in solo practice before moving to the bench. Going it alone is a very hard life out there, according to Dave Szymanski. His two older brothers shared office space but ran separate practices for the better part of a decade. You can feel very isolated, and sometimes you just need somebody to fall back on, says Szymanski. Its not necessarily a safety net where you can make any mistakes you want to and theyre gonna bail you out, but its just knowing that somebodys out there you can bounce an idea off of or ask them for assistance. We just do it. We would do anything for our brothers. The politics of a traditional business environment are different, Daniel Findling says. At the end of the day, youre not going to sell your brother or your father out. But on the other hand, its different from being in a traditional setting because it can be a lot more raw, says Daniel Findling of the flip side of lawyering together. So its a trade-off where you dont have the traditional corporate environment and corporate one-upmanship and this and that, which might be for jockeying for a position. Were less concerned about that, but at the same time you have to deal with the fact that maybe youre still pissed off at some childhood incident or something like that. Nevertheless, those petty sibling squabbles from back in the day sometimes dont get checked at the door each morning. Our partner meetings, like any partner meetings, can get heated, because we bring our histories. They can go from a partners meeting to a family squabble in an instant, Darren Findling says. Highs and lows may be common in every law firm, in every business, but family changes everything. I think if you asked most lawyers, youre gonna find a tremendous amount of them are unhappy with what theyre doing, almost depressed. Were the opposite, Daniel says. I mean that honestly. I love the results, I love the conflict, I love solving problems. And I know I share the same with my father and my brothers in that sense. And in the end, isnt each profession a family unto itself, particularly one thats as social-oriented as the law? Lawyers, I mean I love lawyers, but they are a different breed, they talk a different language, says Judge Tony Viviano, whose three children enable him to enjoy being part of both the legal family and a family of lawyers. Now when I talk to them, Im talking to colleagues and equals, the elder Judge Viviano continues. Im not talking to my daughter Kathy, Im talking to a lawyer.